Sgt Edwin William and Madame Lucienne Annette (Rouviére) Paxton on their wedding day. As I walked down our small country road with my four-legged buddy on this rainy Saturday afternoon, I came across a pine tree. Pine needles had fallen all around it over the years, making a light covering at the base of the tree. My mind was instantly transported back in time over 50 years ago where I see a young boy on the ground in a pine forest with his brothers and sisters gathering pine needles to build forts. Isn’t that what little boys do? This part of the trip was one of my favorites along with the fishing and enjoying seeing my hard-working dad sit on the banks of the lake fishing. His hands were covered with calluses from the outdoor work he did to provide for his family. He could not even bend all of them straight but he still had a firm grip and could wrangle a large fish with ease. My mother had just passed away less than 24 hours before my rainy day walk. My father and mother used to take us to this campground every year when we were children. I took my wife there for our honeymoon and later my own children. They too played in the pine needles. I stood staring at those pine needles under that tree and became oblivious to my current surroundings, having been mentally transported to a time many years ago when our family was all together. My father grew up in the little Midwest town nearby that campground. He played on the high school football team. After his father left while he was still a schoolboy, he was left with helping to feed the family and had to quit school. At some point in his life he served in the Civilian Conservation Corps in Indiana where he helped plant thousands of these pine trees. He talked a lot about his time in the “3 Cs”. He had fond memories of that time of his life. He was 25 when he was drafted into the Army on Nov. 27, 1941, and was at Fort Knox, Kentucky, when Pearl Harbor was attacked by the Japanese. He could not have known nor even contemplated what the Lord had laid out before him for the remainder of his life. A young French girl, who was the only child of her parents, was born in the small town of Vitry Sur Seine ( Vitry on The Seine River) on the outskirts of Paris. She would study English and become an English teacher in a French School. Her mother died when she was still a little girl, so she and her father lived alone. The war started in France long before The United States got involved. The “allemand” (Germans) had invaded France, swiftly overpowering the French military. Many Parisians including my grandfather and his daughter fled south in what they referred to as the “Exodus.” My Great grandfather had a vineyard in the southern France area known as Provence. (“Pro Vawnce”). My mother and her father would live in this great stone house with 11-inch thick walls for a time during the war. I don’t know how long they stayed there, but in order for her to meet my father, the Lord arranged for them to return to northern France and move into an apartment in Paris a couple of blocks from the Seine River. In Mount Gilead, Ohio as a young boy my father used to glide across the lake at this state park on hockey skates. When we were young he bought his three sons hockey skates and our only sister at the time, figure skates. Looking back, I am sure it brought back pleasant childhood memories for him. There was still a lot of joy in Paris these days and on the Saturday after my mother received that peculiar call, she went ice skating at an indoor ice rink in Paris with a girl friend. It is the little things the Lord brings along our way that we think are merely coincidences that changes the current path of our lives forever. Skating around the rink together holding on to each other, her friend let go to re-tie her skates. After a couple times around the rink, she thought her friend had rejoined her as she felt a hand gripping hers. When she turned around to speak to her, she was face to face with the American soldier who would become my father. Another entry in her diary reads “I met an American.” If he were still living he would celebrate his 103rd birthday this year. He went to be with the Lord on February 12, 1996. Suddenly cars quickly speeding from both directions, waking me from my mesmerized moments of memories, rudely transporting me 50 years from that pine forest campground to this overcast rainy Ohio Saturday afternoon in 2019 like a looking glass suddenly shattering into a thousand pieces. I found my self standing there alone with my “Little Buddy,” weeping on the side of the road looking at the gathering pine needles. In loving memory of my Mother and Father: Sgt Edwin William and Madame Lucienne Annette (Rouviére) Paxton. 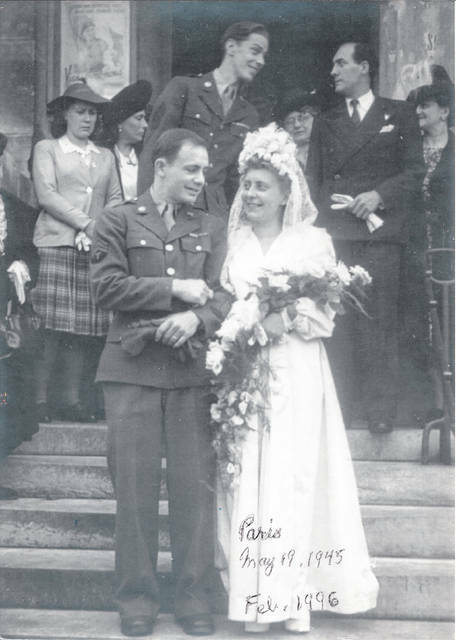 https://www.limaohio.com/wp-content/uploads/sites/54/2019/04/web1_EdwinAndLucienneWedding-1945.jpgSgt Edwin William and Madame Lucienne Annette (Rouviére) Paxton on their wedding day.